SHREVEPORT, LA — The Meadows Museum of Art at Centenary College will wrap up its 2018-2019 academic exhibit season on Friday, April 12, closing two exhibits that opened at the Museum in January 2019. The Meadows will be closed for the summer after April 12 in order to prepare new exhibits for the 2019-2020 year. Joan Hall’s Global Contamination: A Gulf Project and Louisiana Landscapes, an exhibit curated from the Meadows’ permanent collection, will be on display through April 12. The Meadows is open Monday through Saturday, 10:00 a.m. to 6:00 p.m. Visitors to the Centenary campus can continue to enjoy Borders, a sculpture installation by Icelandic sculptor Steinunn Thórarinsdóttir (Steinunn Þórarinsdóttir). 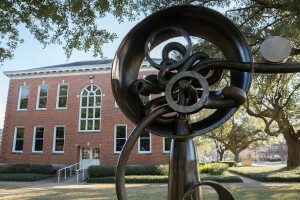 Borders includes eleven pairs of life-sized figurative works in cast iron and cast aluminum and will be exhibited on the Centenary campus through May 2019. It is the second installment in the Meadows Outdoors sculpture series sponsored by the museum. For more information on the Meadows Museum of Art, visit themeadowsmuseum.com.